The Duquesne University School of Pharmacy held its Annual Spring Commencement on May 20, 2017 in the AJ Palumbo Center. Graduating from the School of Pharmacy, 188 students earned the Doctor of Pharmacy degree; two students earned the Doctor of Philosophy Degree in Pharmaceutics; one student earned the Master of Science Degree in Pharmaceutics; and 17 students earned Bachelors of Science degrees in Health Care Supply Chain Management. 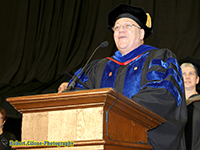 Dean J. Douglas Bricker, the seventh dean of the School, in his opening remarks stated, "The School of Pharmacy celebrates its 91st year of educating the best-prepared pharmacists in the country. These women and men will join over 6,450 pharmacists who have graduated and are proud to call Duquesne University–their University." This year's Commencement speaker was Terry Talbott (P'87), Regional Director of Government Affairs, CVS Vice Chairperson, Pennsylvania State Board of Pharmacy. The day's events began with a Baccalaureate Mass in the Chapel. The Mass is a special beginning to the day-long celebration. A continental breakfast followed in the Student Union Ballroom, prior to the Commencement ceremony. Following the Commencement ceremony, the Dean and the Faculty of the School of Pharmacy hosted a gathering for the graduates and their families in the Student Union Ballroom.